KIA'S OPTIMA SPORTSWAGON, fresh from a facelift, is a good example. While the brand is big on crossovers and SUVs, its Optima estate delivers strongly on traditional estate features, in particular loadspace. Other appreciated 'wagon' qualities include family-friendliness, and being easy to load, drive, and park. At 4.9-metres from nose to tail the Sportswagon is big, but not antisocially so. And while it offers generous inner space both for people and cargo, it does so while wearing sporty lifestyle looks. The athletic estate body, wheelarches filled with machine-faced 18-inch alloy wheels, tapers off with wraparound LED rear light clusters and a raked tailgate to create a good-to-view tourer bodystyle. Power-wise, it's a straight-up coin-toss between diesel and petrol with a new 134bhp 1.6 CRDi turbodiesel (partnered with either a six-speed manual or 7-speed DCT autobox) or a 'GT' version running a 235bhp 2.0-litre turboed petrol engine with a six-speed auto. In keeping with the most popular consumer pick being the 1.6, we've been pootling around in one of these. Alongside its 134bhp, it also fields 236lb ft of torque, cruises to a top speed of 120mph, accelerates to 60mph in 11.4 seconds and, officially, should average 61.4mpg. As we've mentioned the official mpg figure we may as well now reveal our week's real-world average  an impressive 54.2mpg. Not only is this engine agreeably frugal, but the new four-pot's 236lb ft is gutsy enough to feel lively from pull-away and when running with the pack on hilly dual carriageways and fast motorways. The twin-clutch autobox runs up and down its seven gears gracefully, and even boosts the economy  the best logged on some long motorway journeys was 60.6mpg. Thanks to a 70-litre fuel tank, pit-stops could be seven hundred miles apart. Kia's Drive Mode lets you select between Comfort, Smart, Eco, and Sport driving modes. Smart, as its name suggests, does it all for you, switching between modes to whatever is best for the moment and your driving style. If you want full control of the gears it's yours for the taking using the paddle-shifters. The DCT box shifts fluently even when pressing on in Sport, where it holds onto gears longer and downshifts helpfully when braking. Open the driver's door (like the other three, it opens wide for easy entry) and you're faced with a spacious and welcoming cabin. Settle behind the wheel and the shapely, well-padded red-piped black leather seat is as comfortable as it looks; and there's perfect visibility ahead and to the sides. Both front chairs have full power adjustability along with three-stage heating and three-stage cooling, and powered lumbar support; the driver also gets a two-setting seat-and-mirror position memory recall and a heated steering wheel. Not only are the seats big enough to be truly accommodating but there's space all around including shareable room for elbows between the front seats and a full fist of air between heads and the panoramic glass sunroof (one-shot-op with tilt 'n' slide and blackout blind). The tactile, soft-touch dash is cleanly arranged with, centre stage, an eight-inch infotainment touchscreen incorporating TomTom navigation supported by speed camera, traffic, weather, and local point of interest information. Screen and map graphics are sharp and clear; underscoring the display is a strip of 'hard' buttons enabling direct jumps to all the menus. Not only is the driving position spot-on with a comprehensive multifunction (driver's display, voice, phone, audio, cruise, speed limiter, and a favourite button) perforated leather-wrapped, flat-bottomed steering wheel but the instrument panel is refreshingly uncluttered with just two main dials with white-on-black faces for speed and revs bracketing a multimode driver's information display that shows all the usual trip data along with vitals such as an instantly readable digital mph readout and posted speed limit. Augmenting the excellent ergonomics, the instrument cluster is set at exactly the same height as the large touchscreen so you can check everything out in one quick sweeping glance. Many drivers will be pleased to find traditional-style button-operated controls for the fast-acting and very efficient dual-zone climate system. Entertainment, infotainment and comms are all well served by a 490-watt harman/kardon premium sound system with MP3-compatibility, DAB radio and Bluetooth handsfree with music streaming, plus a wireless charging pad for your smartphone with mirroring via Apple CarPlay and Android Auto, both with voice control. The quiet cabin also makes for easy listening  and that includes conversations with your passenger. The TomTom SatNav provides traffic, speed camera, local search, and weather updates along with 3D mapping and directions that are foolproof from the moment you set off. In-cabin storage can cope with the average family's needs with a very accommodating glovebox, a capacious bin (with a useful upper tray) below the front central armrest, long bottle-holding door pockets, a drop-down case for your shades, and dual-use cupholders under a sliding cover. 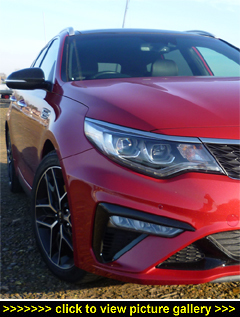 While even entry-level Optima models come well equipped, the penultimate GT-Line S has got the lot  in addition to the numerous items mentioned elsewhere there's keyless entry, locking and start, four one-shot windows, front and rear parking sensors and a multi-view reversing camera system with 360-degree surround and bird's-eye views (if you still don't want to park-it-yourself there's a smart onboard parking jockey to carry out parallel entry and exit and perpendicular parking on your behalf. Also fitted is privacy glass, ambient lighting (six different colours), electronic parking brake with auto-hold function, powerfolding heated door mirrors (on demand and automatically on locking and leaving), auto-dimming rearview mirror, auto wipes and lights, dynamic cornering lights, speed limiter, drive-off auto door locking, tyre pressure monitoring, hill-start assist, a full suite of airbags, height-adjustable seatbelts, tyre pressure monitoring, speed limit information, alloy pedals, and a set of 18-inch alloys. In what feels like an ever-shrinking world personal space is a valued commodity, and the Sportswagon comes with more than its fair share. Riding shotgun is undeniably a sought-after spot but the light and airy back cabin is no second-best place in which to travel. Despite the rear seating being set some six inches higher than the front row, passengers still get a fist of headroom and benefit from wide-ranging views through the deep side windows. There truly is masses of room to chill-out, even for grown-ups, and that's with six-footers seated up front. The backrests are set at relaxing angles so you can really stretch out. And if you have to carry four passengers, three will fit easily side-by-side with the low floor tunnel ensuring plenty of room for any fidgety feet. Adding to the satisfaction of the nicely contoured and heated rear outer seats are pull-up sunblinds built into the doors, privacy glass, a wide, padded central armrest (with built-in cupholders), large comfy outer armrests, dedicated air vents, real-world door bins, large elasticated pouches on the front seatbacks, reading lights, damped grabs, a 12v power socket and a USB charging port and, for youngsters, Isofix child seat fixings. The Sportswagon serves up a decent ride, remaining comfortingly unruffled despite bumps and dodgy blacktop; the stiffer (there's been a 50 percent increase in torsional rigidity) new bodyshell and independent suspension tweaks can take credit for that, and for keeping passengers happy both in town and country. Comfort-orientated 235/45 rubber helps, too. On the move the Sportswagon remains reassuringly 'planted' at speeds, body movements are well controlled, it corners confidently and drives fluently on all roads in all traffic conditions, loping assuredly along motorways. Feeling agile for its size, it serves up a well-mannered drive. These days it's very reassuring to have plenty of active safety systems looking out for you. Especially useful is the blind spot warning that alerts you if you pull out of your lane and something is coming up fast in your blind spot. There's also Forward Collision Avoidance with pedestrian recognition, Lane Keep Assist, Rear Cross Traffic Alert, and Driver Attention Warning, along with the usual stability and traction control systems, and Adaptive Smart Cruise Control to take the strain out of heavily-congested motorways. Another much appreciated feature when driving at night is the fast automatic main/dipped beam switching of the full LED headlights which takes much of the uncertainty out of driving along unfamiliar roads. The boot does all you'd expect, and then some. For instance, the power tailgate opens automatically totally hands-free  with the smart key in your pocket just stand behind the car for three seconds and say 'Open sesame' and the wide tailgate opens and quickly rises granting unrestricted access to 552 litres. Actually, I lied  you don't have to say the magic words! The boot can also be opened and closed using the dash button or the smart key. When you need to do some heavy-duty hauling just pull the levers in the boot sidewalls to drop the rear seatbacks in one easy action  the result is a seamless and totally flat-floored loadbay with a helpfully low load-sill that can swallow 1,686 litres of cargo. Being a Kia you get more than just a boot: under the floor is a custom slot for the luggage cover roller blind along with a set of three good-sized compartments, while above it is a set of multi-configurable sliding rails with integrated harnesses to ringfence whatever it is you're carrying any which way you please. It's also worth mentioning that the versatile 40:20:40-split rear backrests allow you to mix-and-match long loads and passengers at will. And when it comes to towing, the 1.6 CRDi will pull a braked 1,500kg.